I appreciate your artist statement and shadow box for explaining how you aren’t what you seem like seed. It shows how you aren’t just a generalized person but very specific in who you are. BUT, you didn’t space after a period once. But everything else is sick. I’m very impressed by your post, “Shadow Box” because the way you explain your dominant and counter narratives is very vivid and it really speaks to me because I can really relate to the part that you wrote about people assuming that just because you’re latina you’re Mexican, it’s honestly super annoying and I understand how it feels. I also put some baby pictures of me when I was younger and pictures of my family and I because I wanted to show my viewers that I have a family to make proud and a family that supports me so why would I be going out and making trouble for them. One sentence that stood out to me was: “My dominant narratives I put pictures of models because society really use to tell me to have a model looking body”. I think this is very powerful because I understand how it feels to have to look like what society says is right and have to stand up to what society says is beautiful. And you putting models on your dominant narrative side of the shadow box is amazing because it shows that, that is what society thinks is beautiful but then your counter narrative comes in and shows society that you are beautiful just the way you are no matter what they have to say. Thanks for your writing, I look forward to see what you write next because I think it’s very inspiring. Hi Estefani! I’m a second year student at San Jose State University. I really love that you are speaking up against negative stereotypes about Oakland and being Latina, especially in the way that you did! Using your baby photos is a great form of emotional persuasion, and lets people see what your life really looks like. I also noted how you spoke about the societal pressure on girls to look like models. I feel that many girls can relate to this and would probably place it in their own dominant narrative, too (as unfortunate as that is!). I think that it is really inspiring that you value your natural beauty and pride in your ethnicity! I love the look of your Shadow box and I think you did a great job representing your counter narrative. Hi Estefani, I am a student at San Jose State University. I found your shadow box to be very relatable. I like how you were able to describe who you are and little bits of the culture that you are from. Your dominant narrative is something i have experienced myself where people assumed I was Mexican even though my family is from El Salvador. I appreciate that you were able to write about yourself and how you are proud of your beauty and ethnicity. 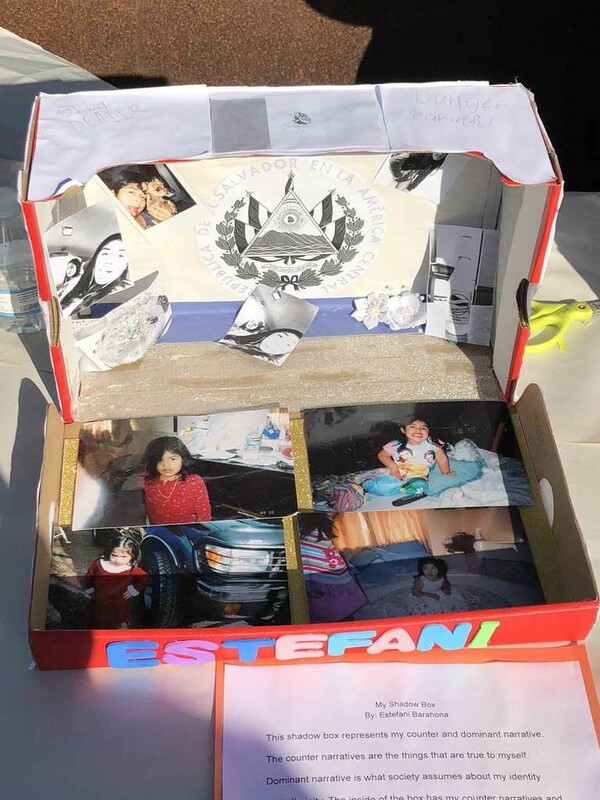 Your shadow box was a beautiful representation of yourself. Estefani by is licensed under a Creative Commons Attribution-ShareAlike 4.0 International License.